A bill of gun purchasing is bogged down in Congress by objections over funding and who should be barred from buying a firearm. The legislation aims to fix flaws in the national background check system that allowed Seung-Hui Cho, a mentally ill Virginia Tech University student of Korean origin, to buy guns for a killing spree April 16. The bill would tighten requirements for states to share gun purchasers' mental health information with the federal government. Majority Democrats in the Senate were poised as early as this past Monday to bring the bill to a vote until Sen. Tom Coburn, a Republican, objected. Coburn says he has concerns that billions of dollars of new spending in the bill is not paid for by cuts in other programs. And he says the bill does not pay for appeals by veterans or other Americans who feel they have been wrongly barred from buying a gun. "As Congress prepares to raise the debt limit once again, it is not too much to ask politicians to do the job they were elected to do and make choices," Coburn said Wednesday. "Veterans, or any other American, should not lose their (constitutional) rights (to bear arms) if they have been unfairly tagged as having mental health concerns." Propelled by a rare alliance between the National Rifle Association and majority Democrats, the legislation was passed in similar form by the House and would be the first major gun control law in more than a decade. "Nothing can bring back the lives tragically lost at Virginia Tech, but this amendment will begin to repair and restore our faith in the (national background check) system and help prevent similar tragedies in the future," said Judiciary Committee Chairman Patrick Leahy, a Democrat who is sponsoring the bill. The mentally ill Virginia Tech student had been ruled a danger to himself during a court commitment hearing in 2005. He had been ordered to undergo outpatient mental health treatment and should have been barred from buying the two guns he used in the rampage. 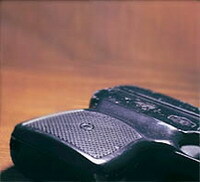 However, the state of Virginia never forwarded the information to the national background check system. The legislation clarifies what mental health records should be reported to the National Instant Criminal Background Check System and gives states financial incentives for compliance. The Senate version of the bill is very similar to the House version, with a few changes. Once the bills are reconciled they go to President George W. Bush for signature into law.